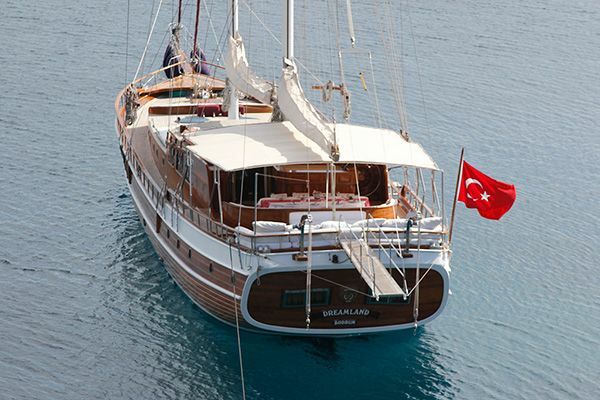 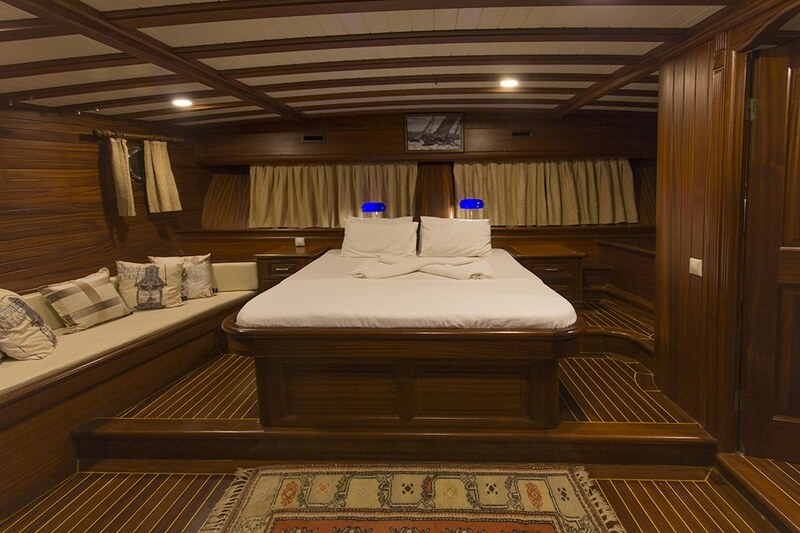 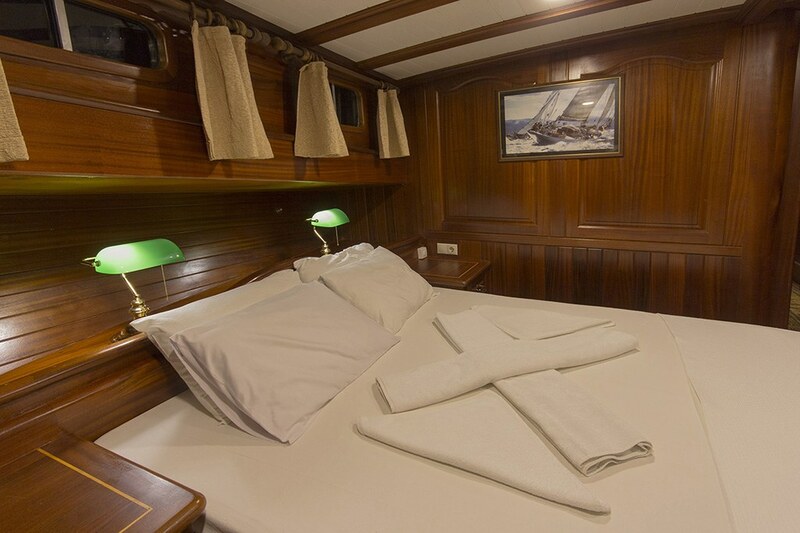 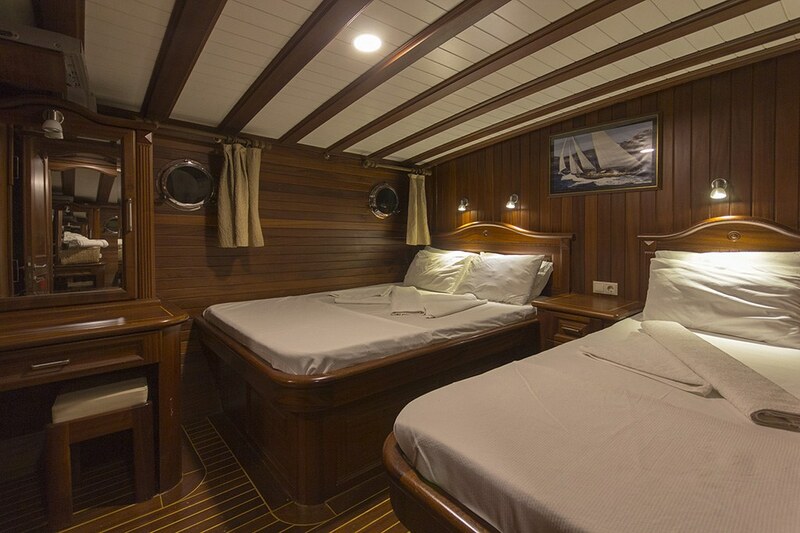 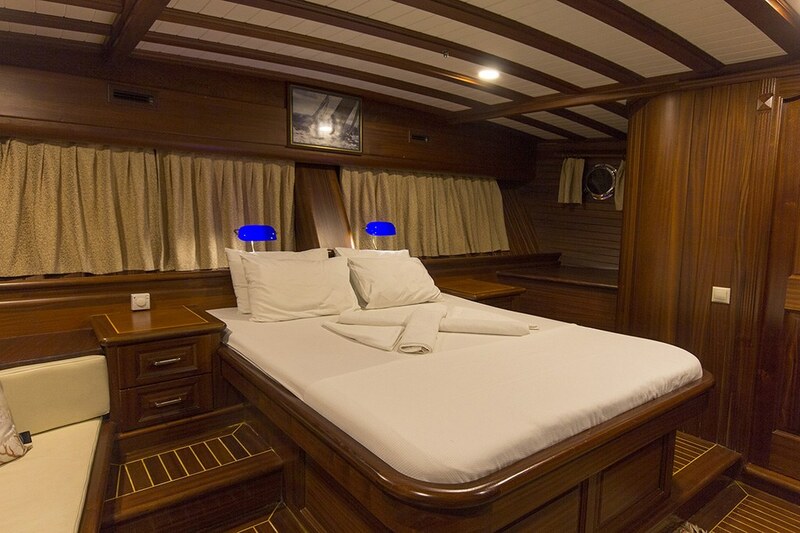 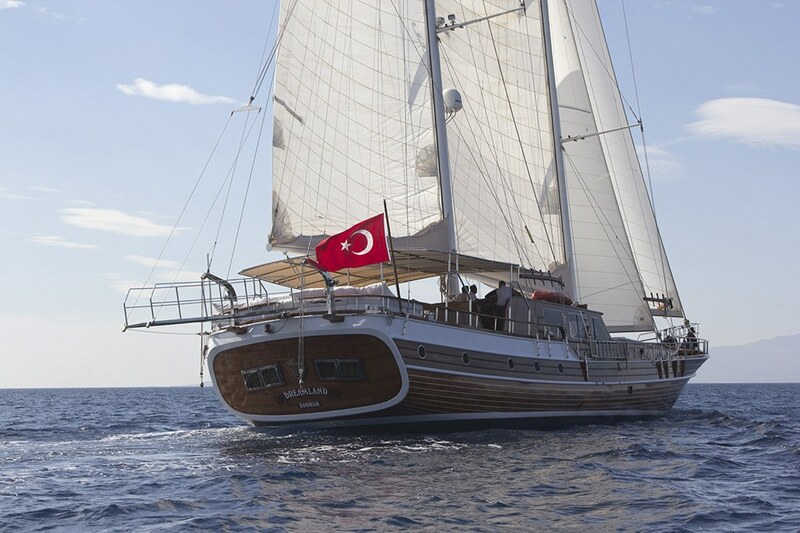 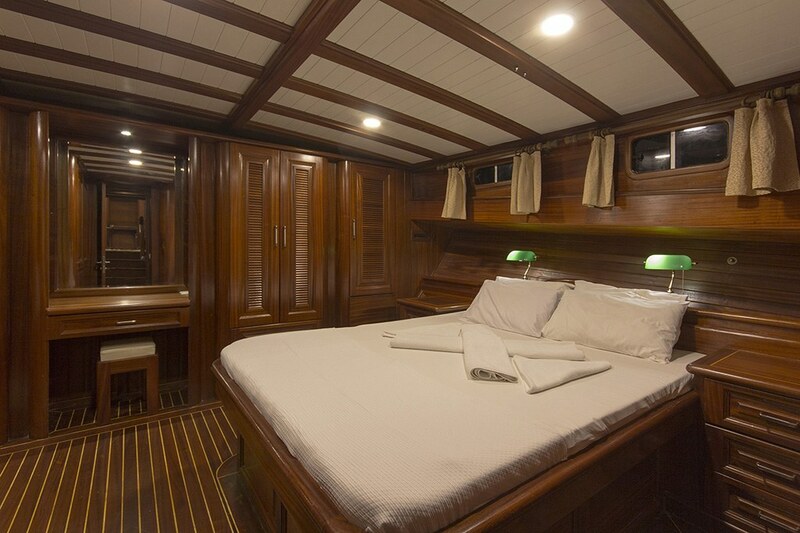 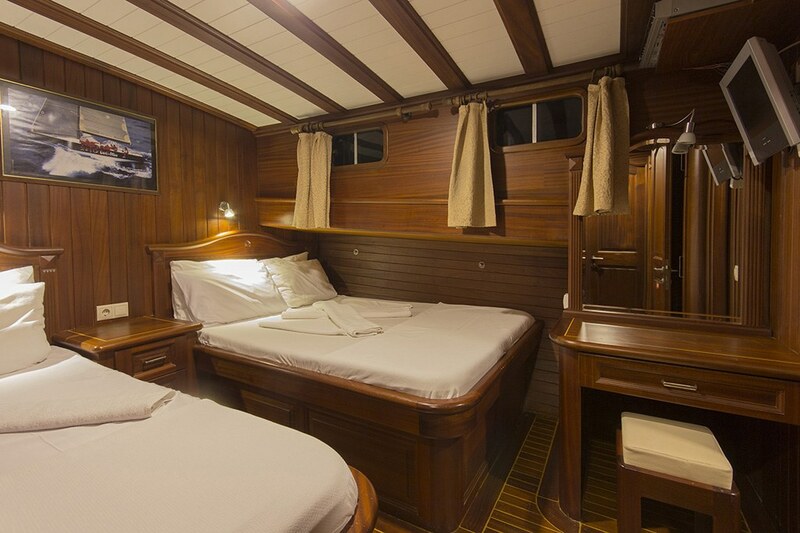 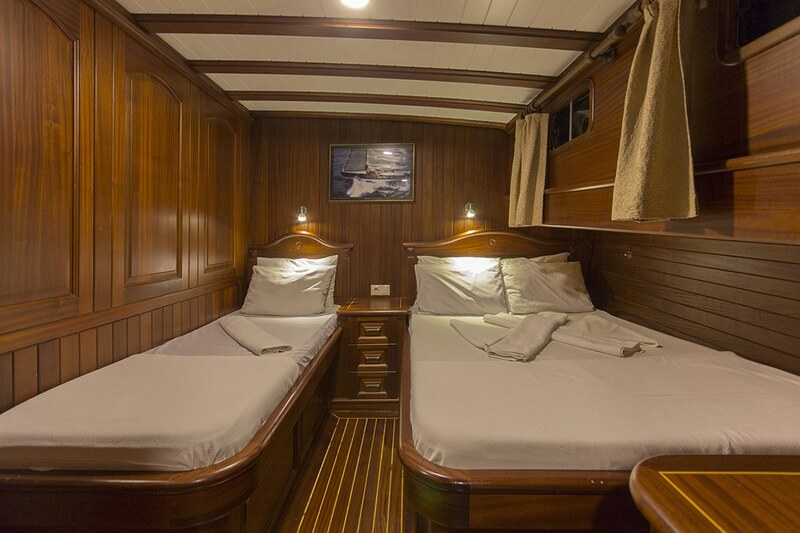 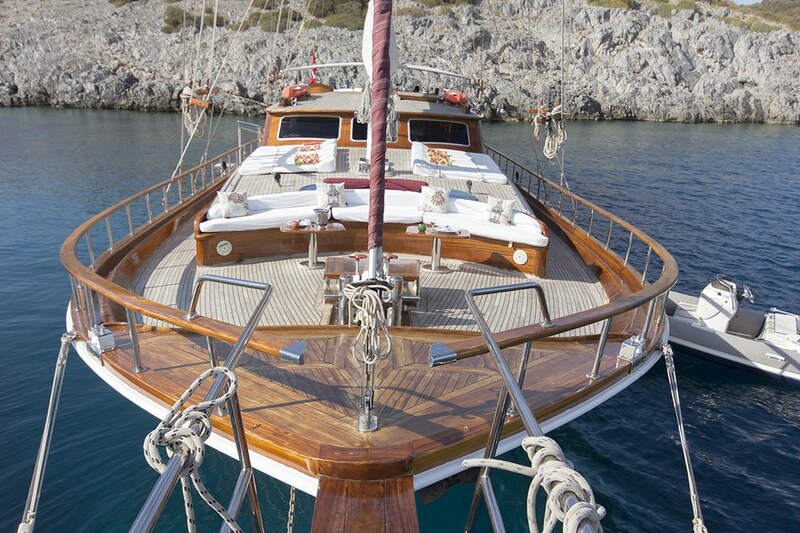 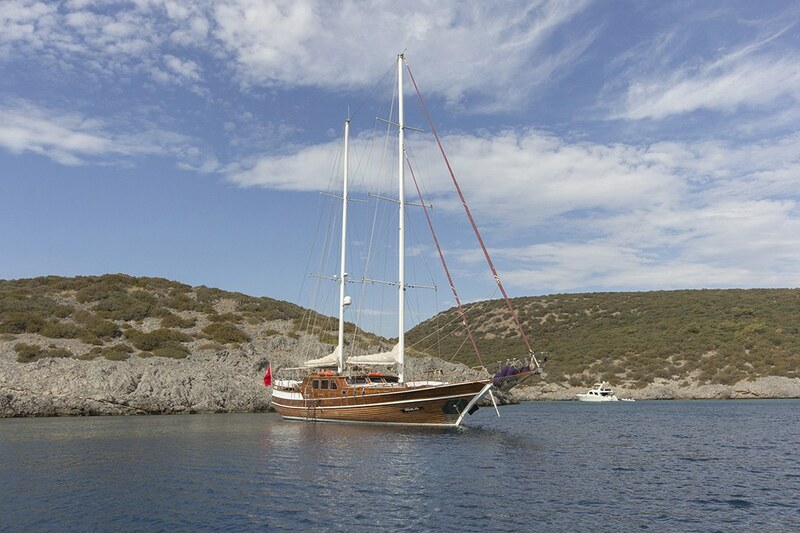 Gulet Dreamland, 32 meters 6 cabins deluxe private Gulet based in Turkey. 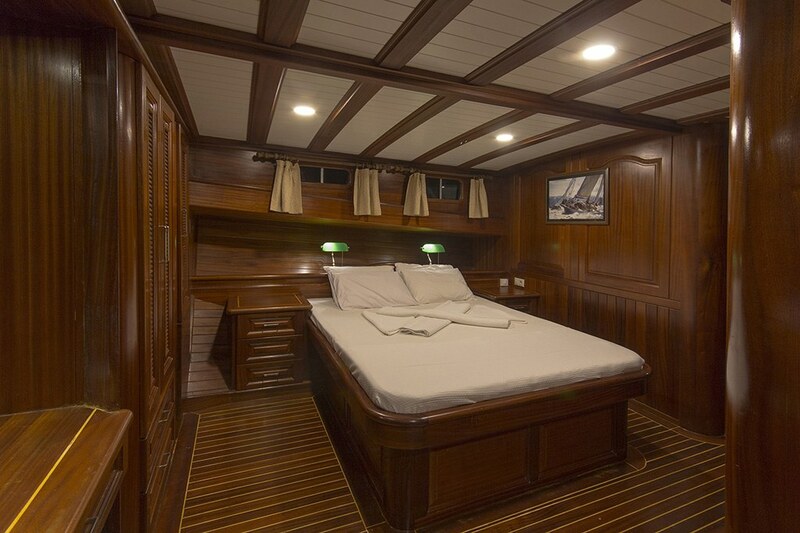 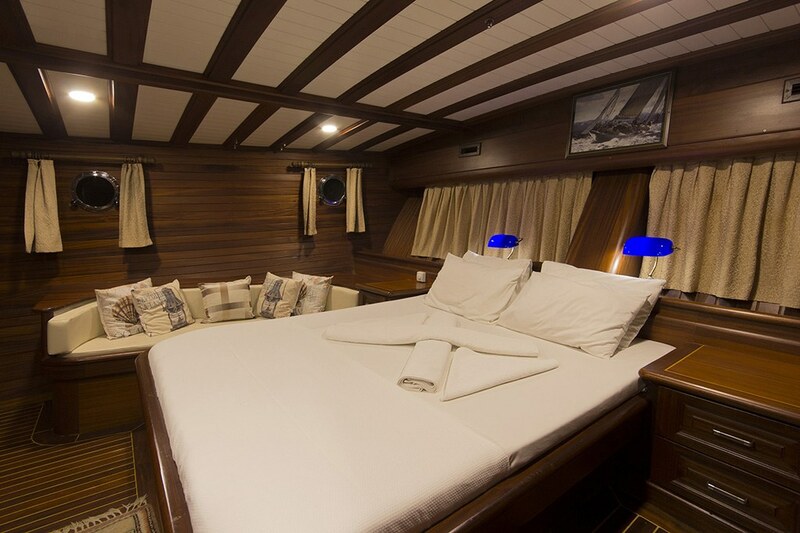 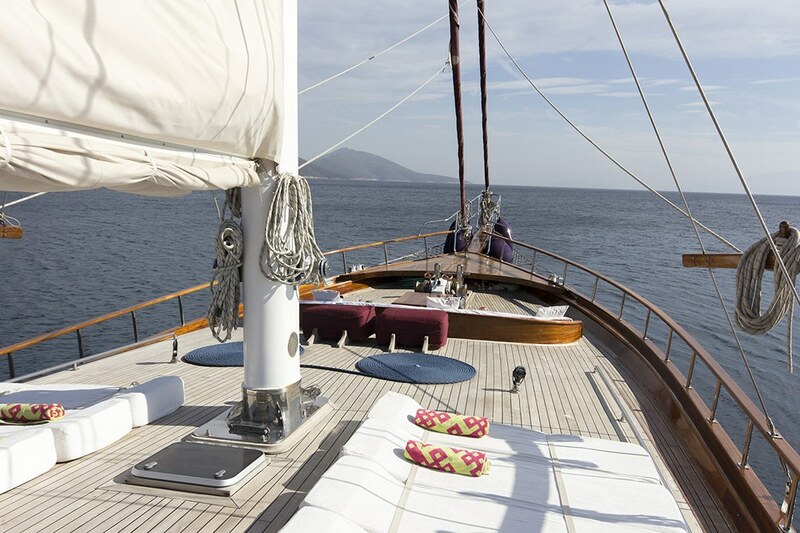 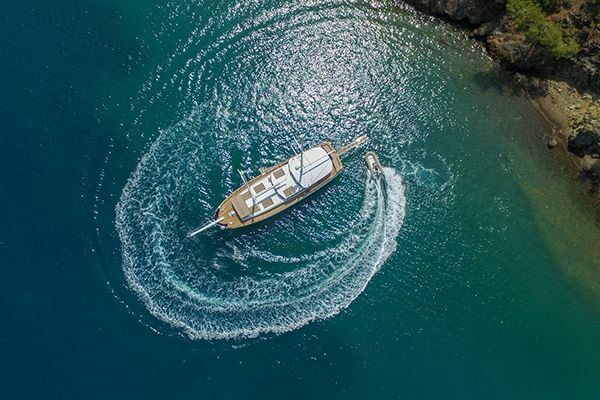 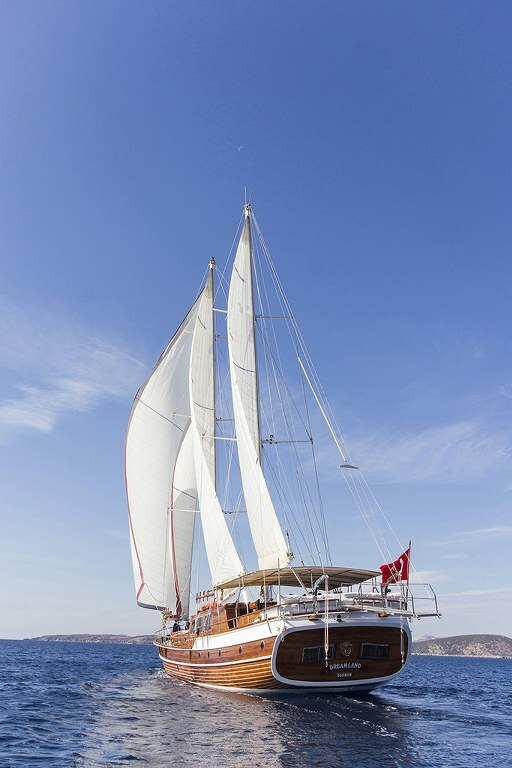 The Deluxe gulet Dreamland is a beautifully crafted 32 metre 6 cabin gulet built in Bodrum by master shipwrights using luxury timbers- mahoghany, iroko and teak. 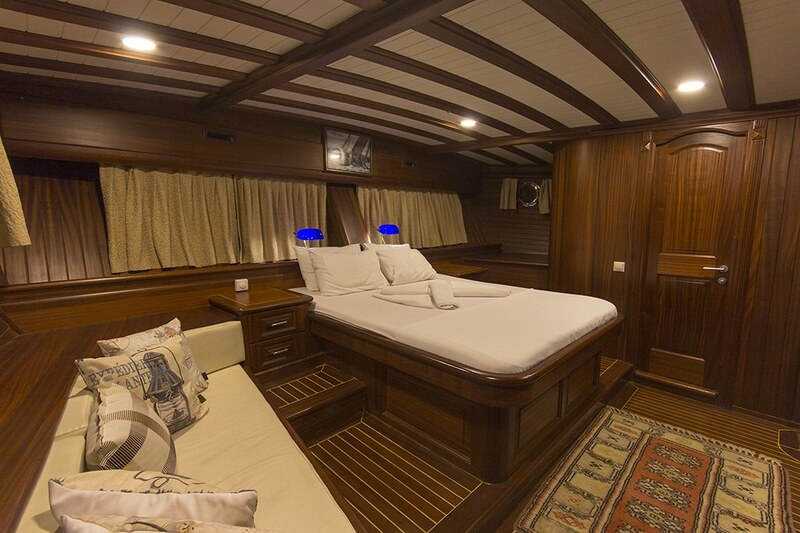 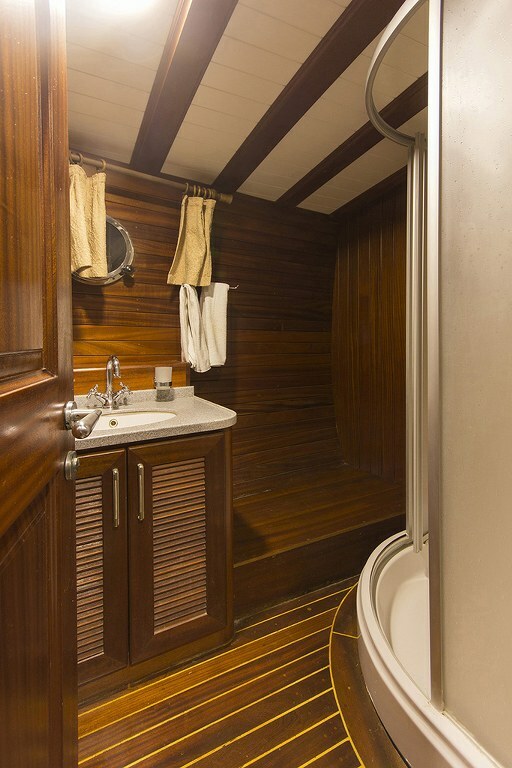 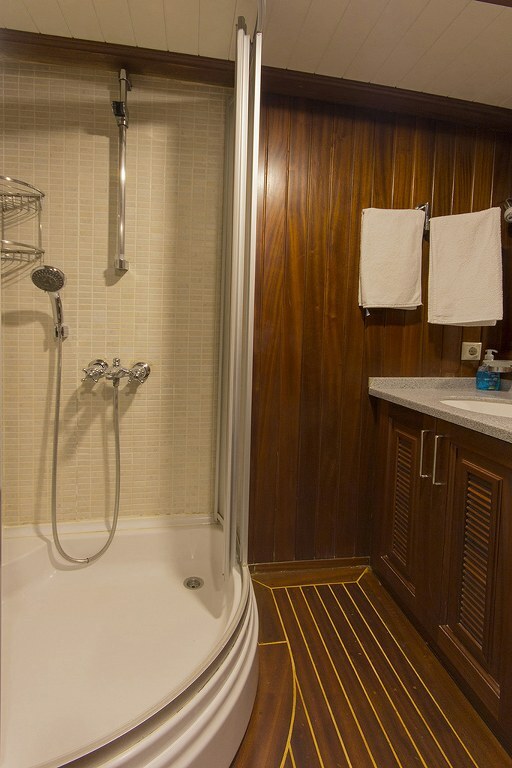 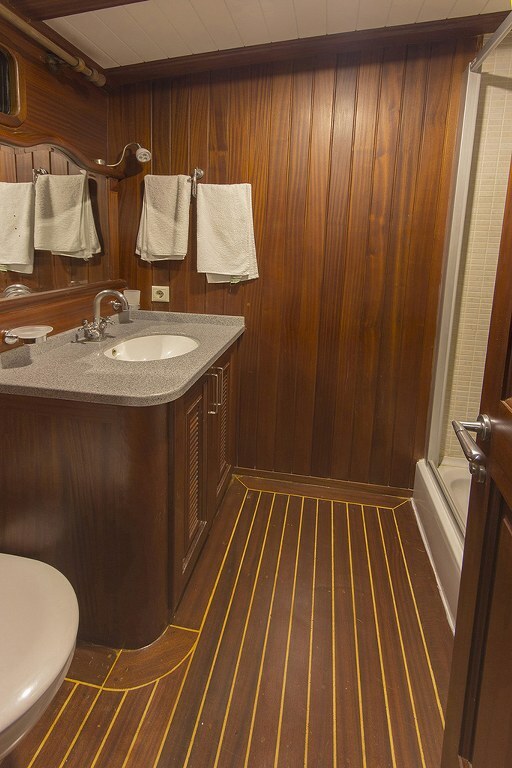 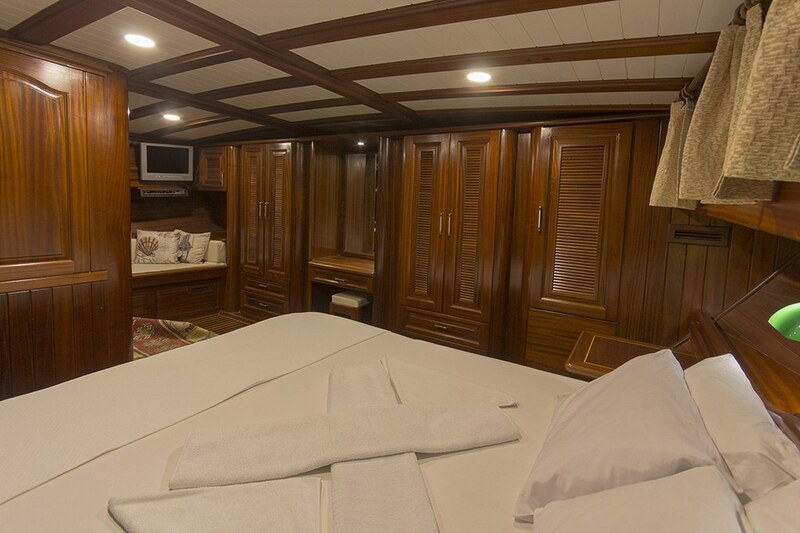 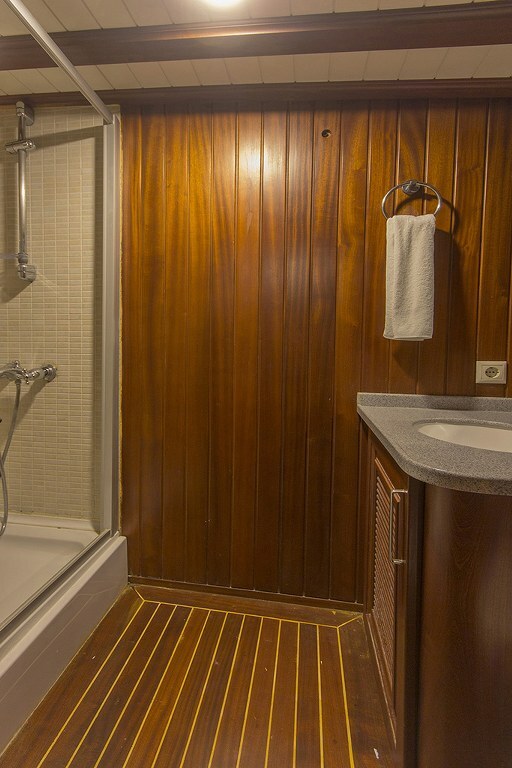 Each of the six cabins is lined in mahoghany giving a superb timber finish to spacious gulet cabins. 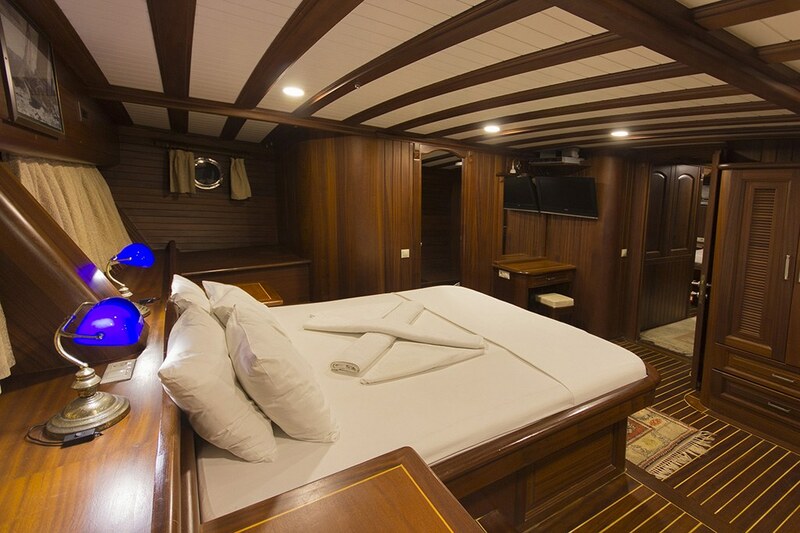 Up to twelve guests can be comfortably accommodated on the Dreamland, with two master cabins with double beds and four cabins which hold a double and a single bed each, giving maximum flexibility for families and groups. 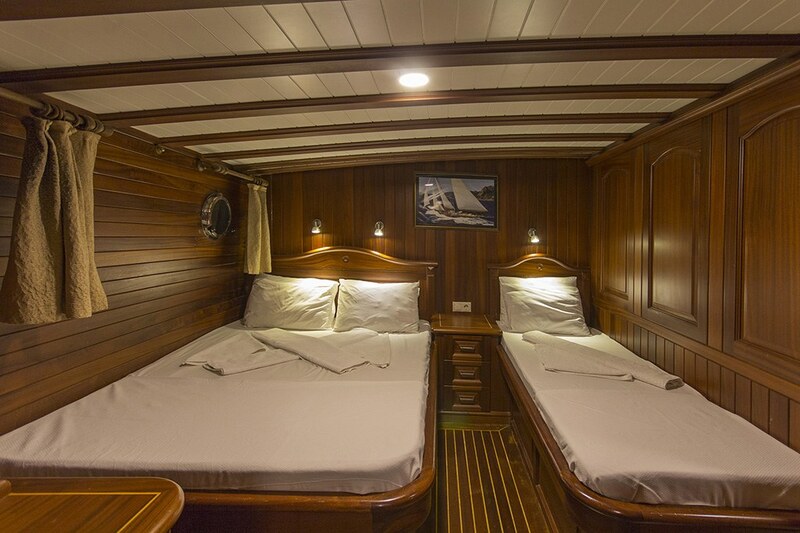 One master and two triple cabins are located forward, and one master and two triple cabins are placed aft. 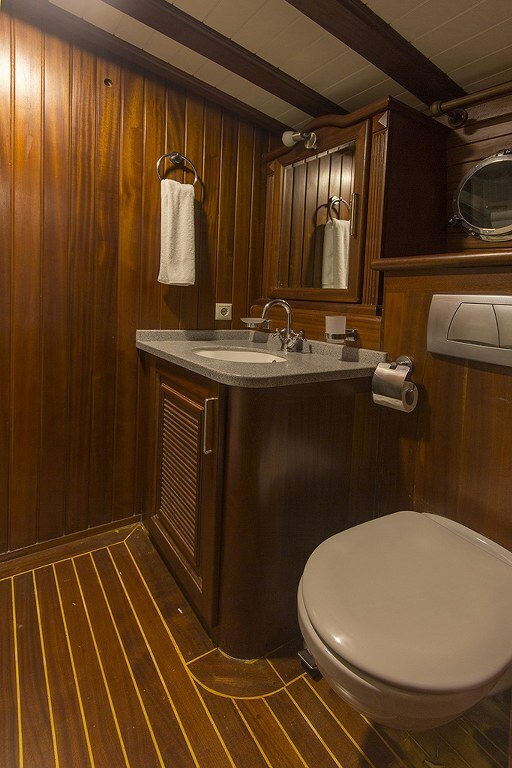 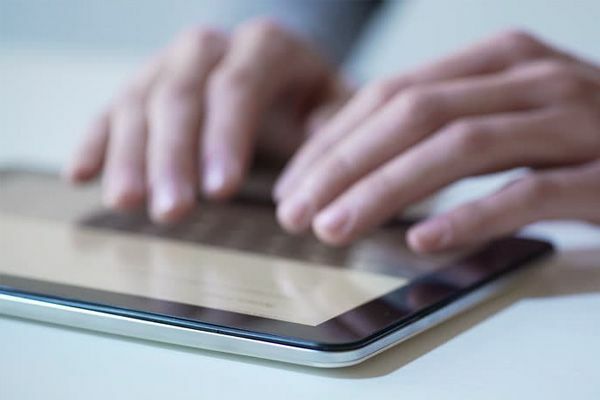 Each cabin is air-conditioned, with a TV/DVD, and well-fitted ensuite bathrooms with shower cabins, and hairdryers provided. 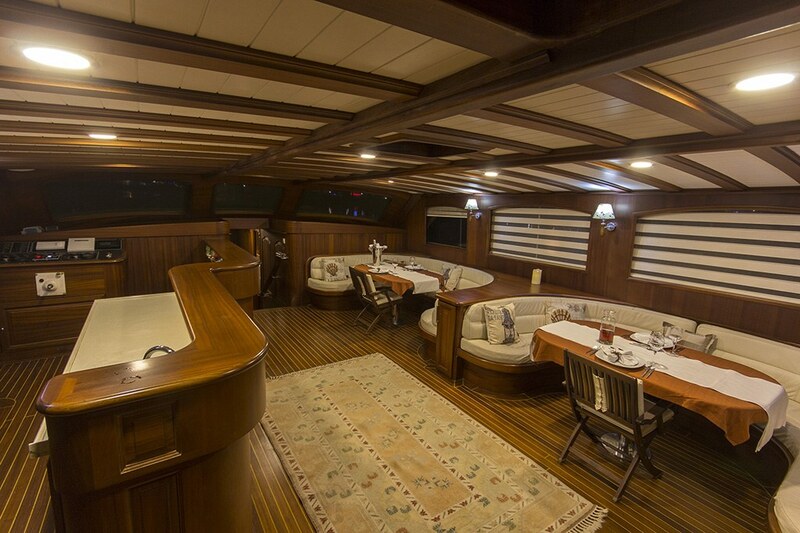 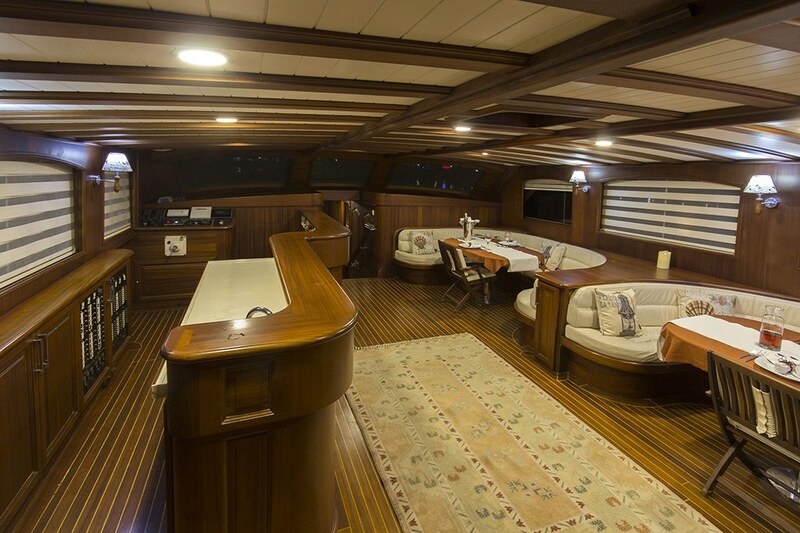 The saloon on gulet Dreamland has air-conditioned with two dining tables in seating nooks giving the option of indoor dining, or relaxing with the main home theatre system and music system. 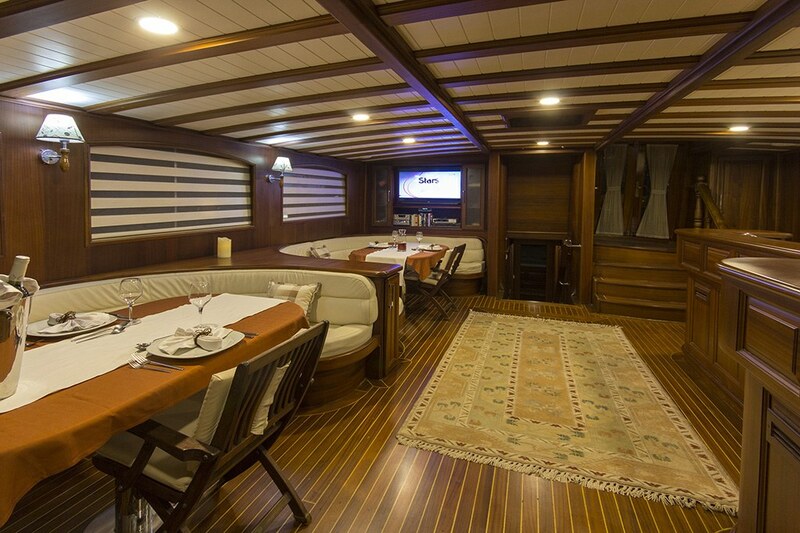 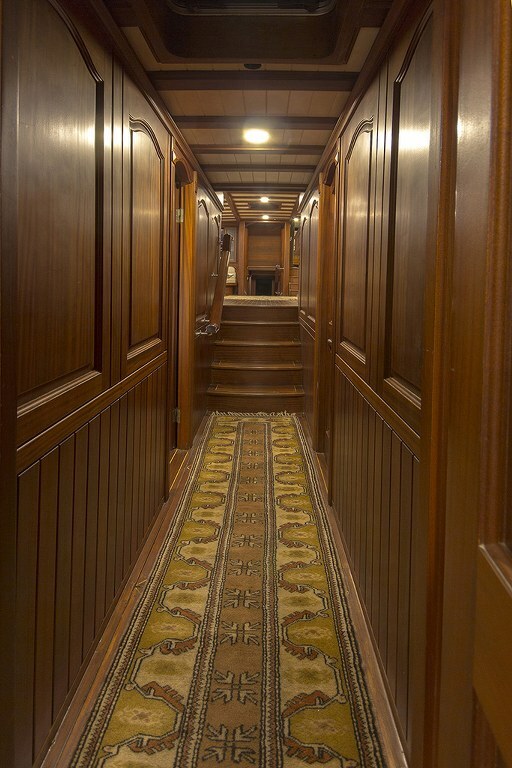 The indoor service bar and galley below it, are also entered from the saloon. 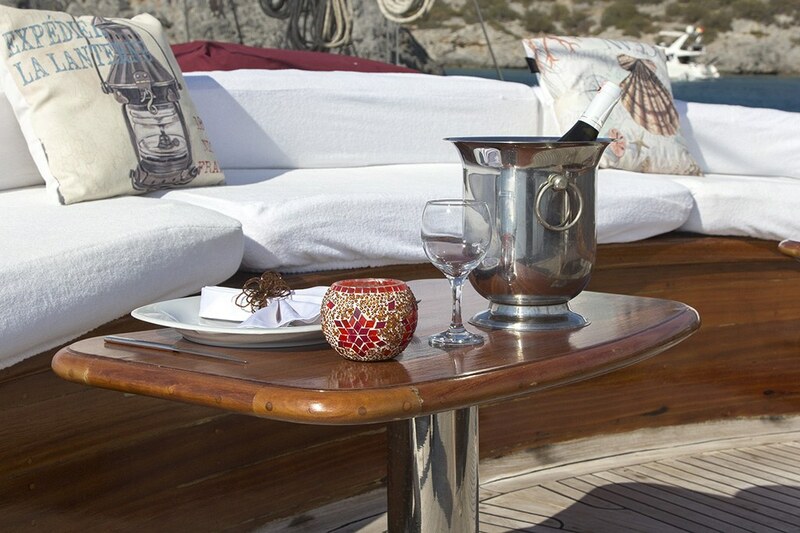 On deck are the main relaxation spaces where the cruising holiday life is really to be enjoyed. 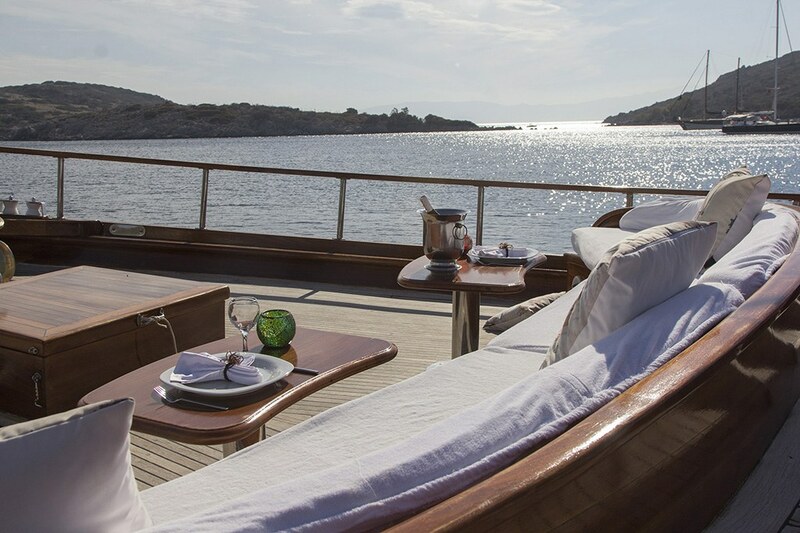 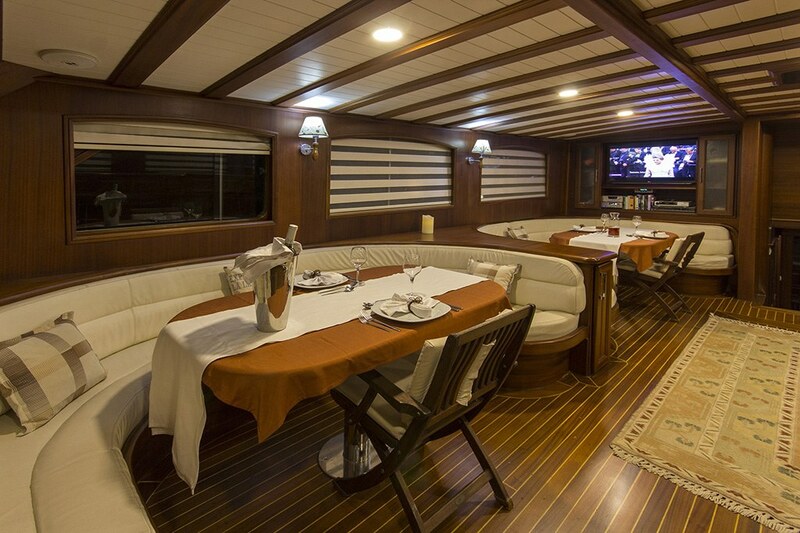 The aft deck, has two large cushioned seating areas shaded by the fixed awning that covers the entire aft deck. 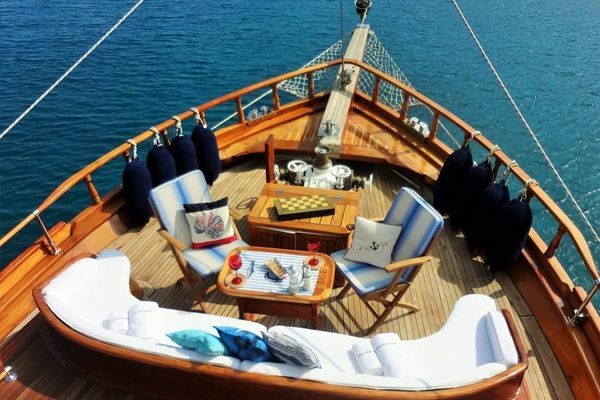 A very wide cushioned bench across the stern invites guests for some very lazy relaxation, and it is faced by a small cushioned conversation bench. 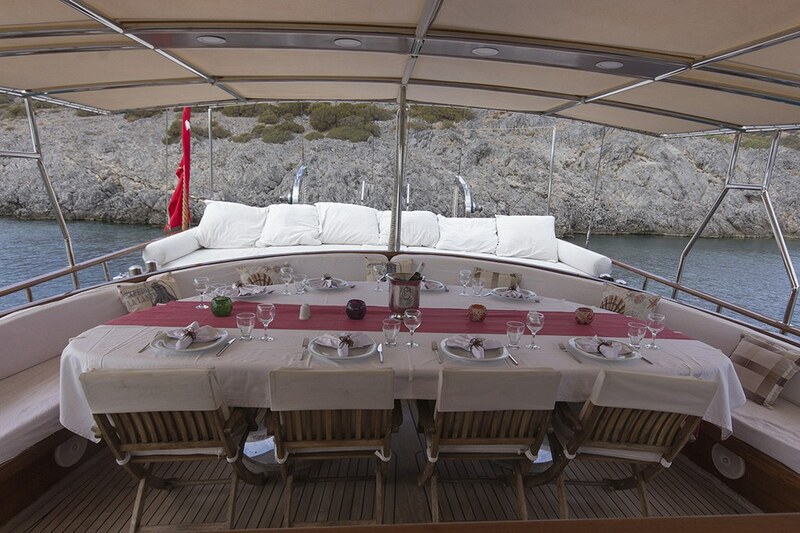 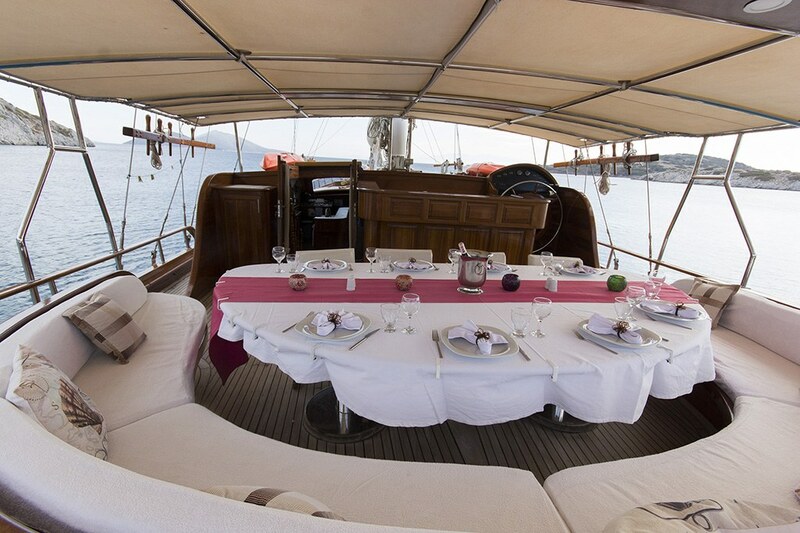 The large outdoor dining table has chairs on one side and a large curved and cushioned bench seat on the other side, and service by the crew is made from the deck bar. 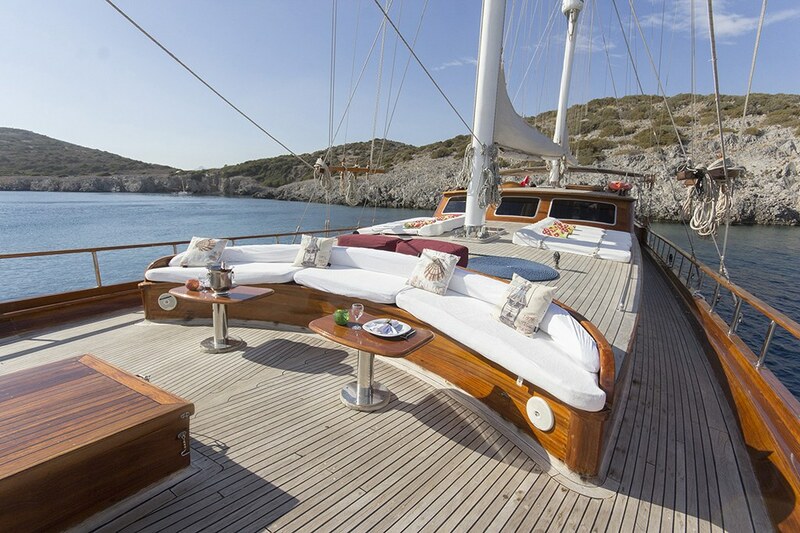 Up on the foredeck there is ample space for a large sunbed for each guest and also a curved bench seat in the bow with small tables for snacks and drinks, making it the ideal spot for a sunset gathering. 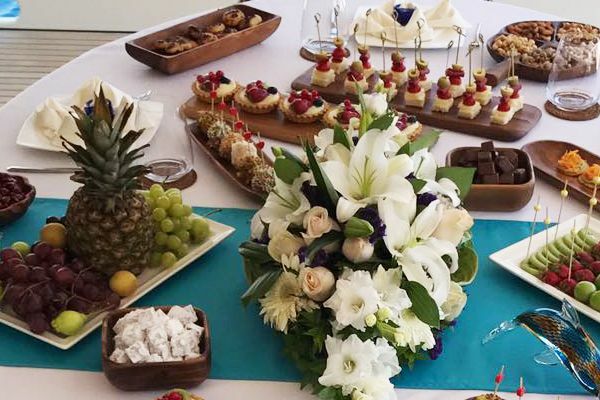 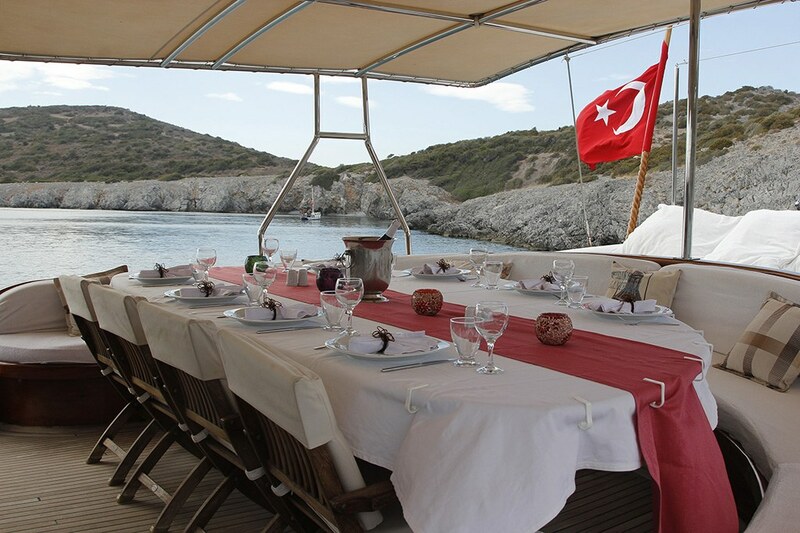 The Captain, cook and three crew have their own quarters, and carry out all the tasks aboard, preparing and serving all meals and drinks, cleaning, running the boat and, best of all, shaking out the sails for that very special sailing experience on the Aegean. 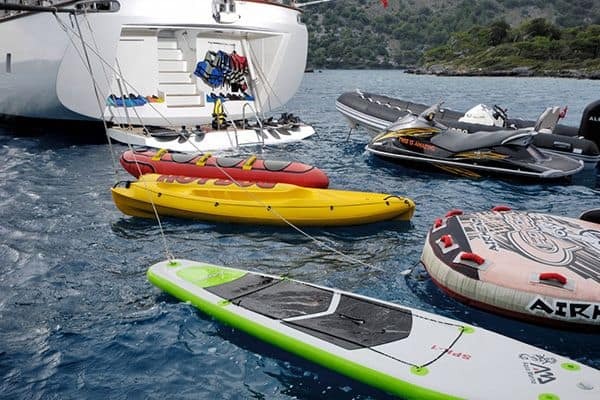 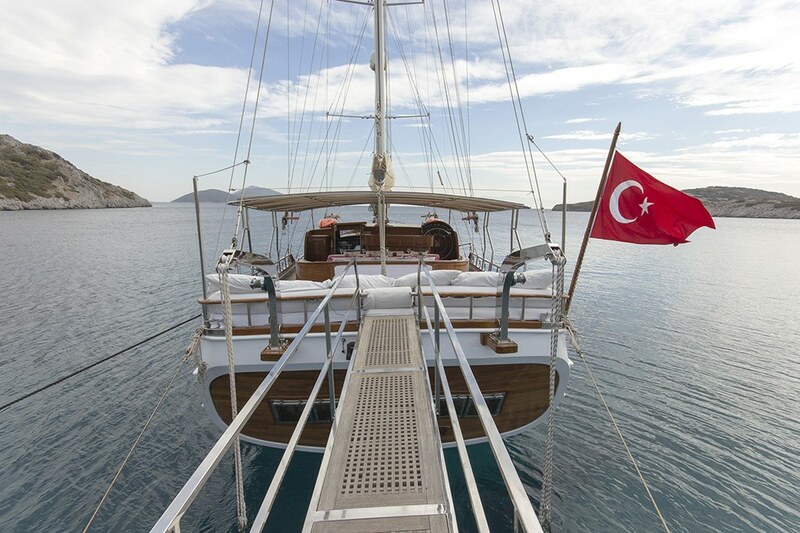 The active guests on board will find they can enjoy the snorkels, canoes, waterski, and ringo water toys also on board, when the gulet drops anchor in the many fascinating bays of the Turkish Coast and Greek Islands that can be explored from Bodrum. 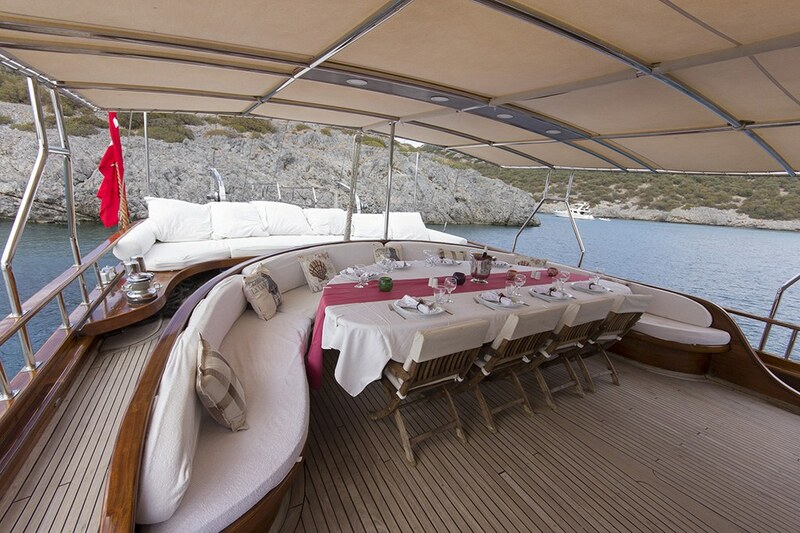 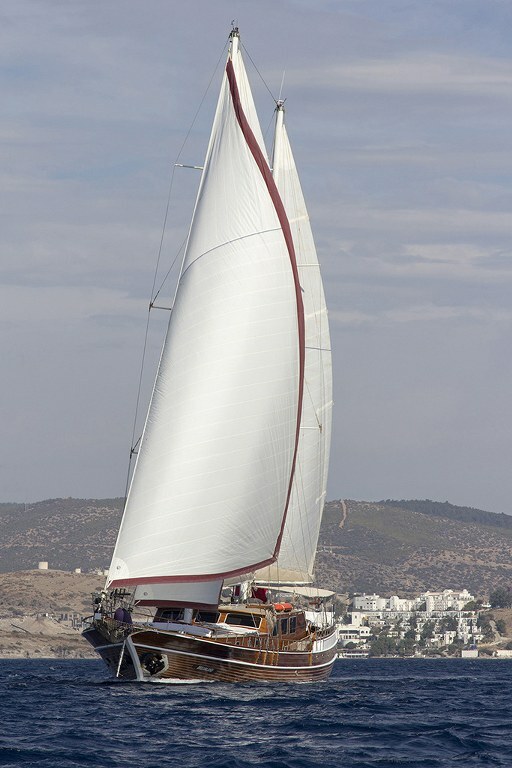 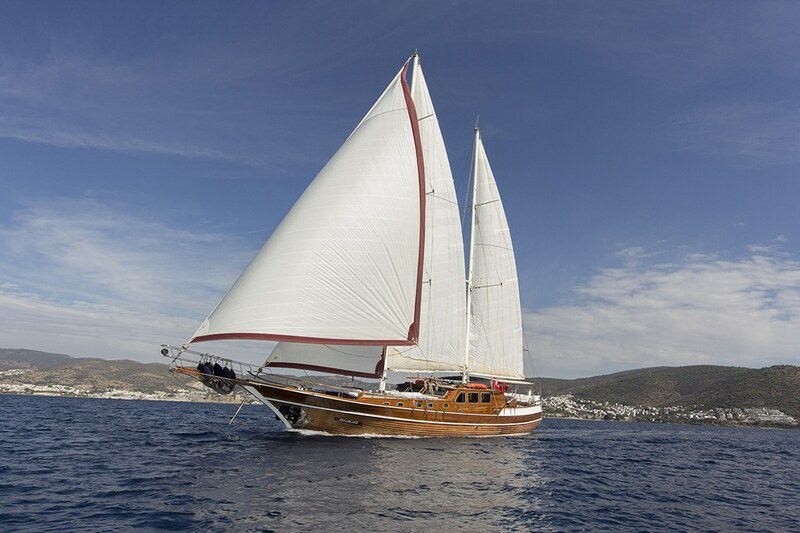 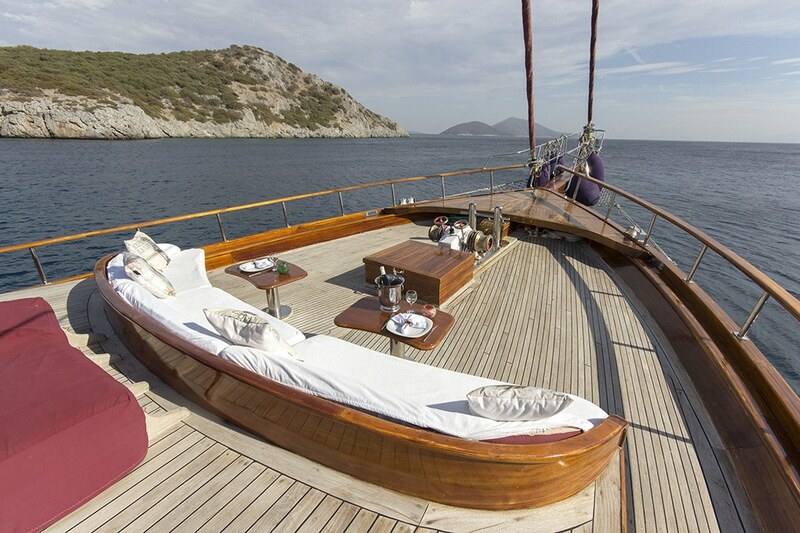 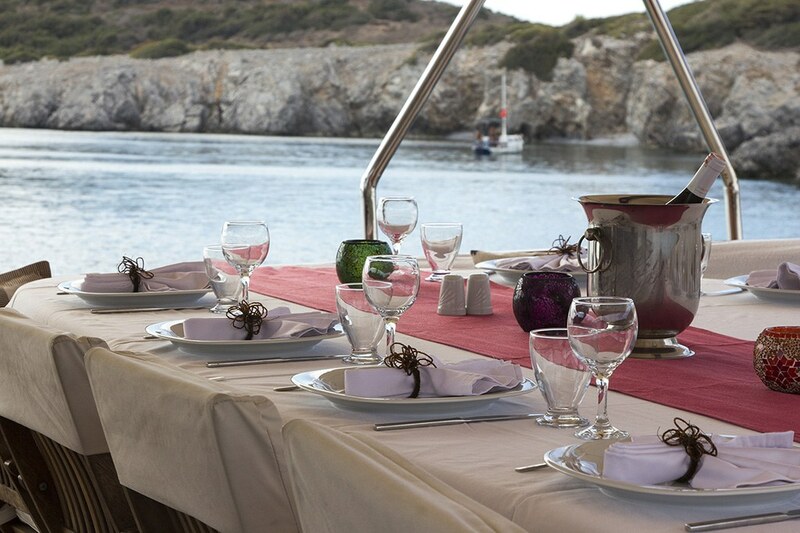 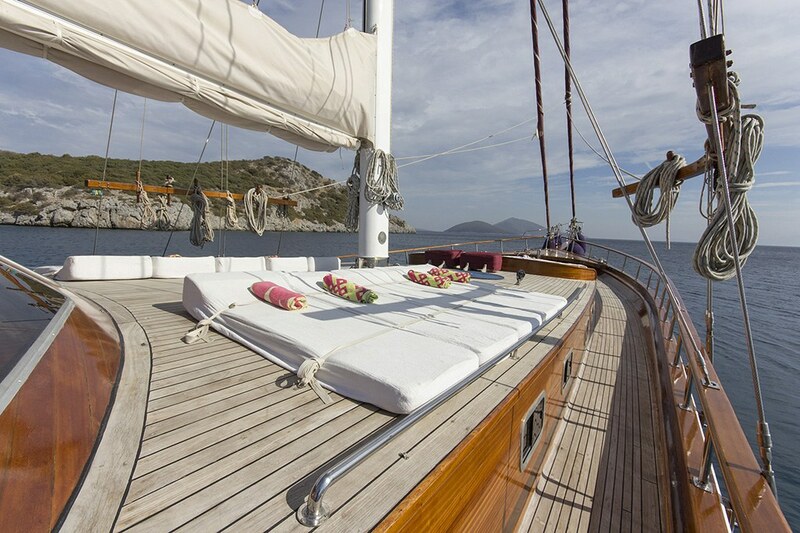 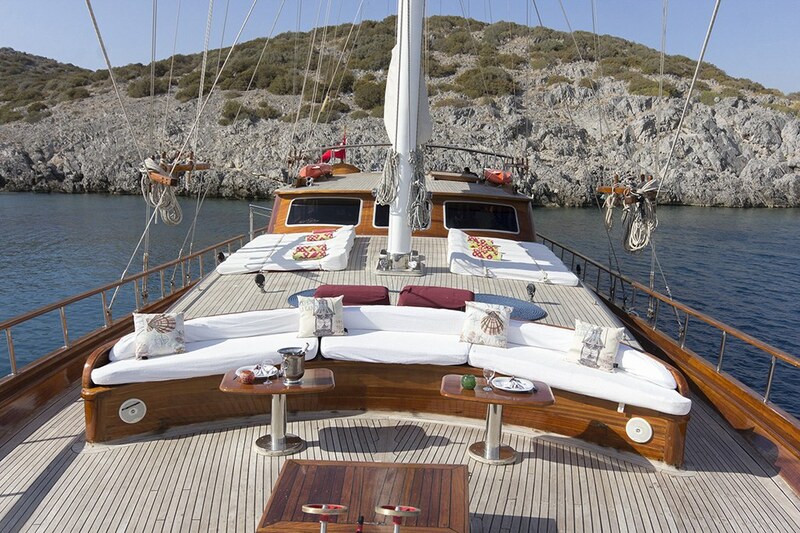 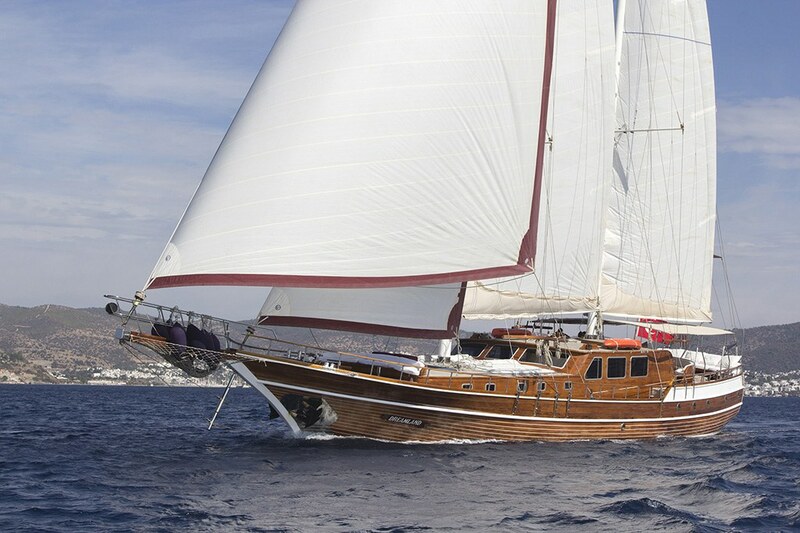 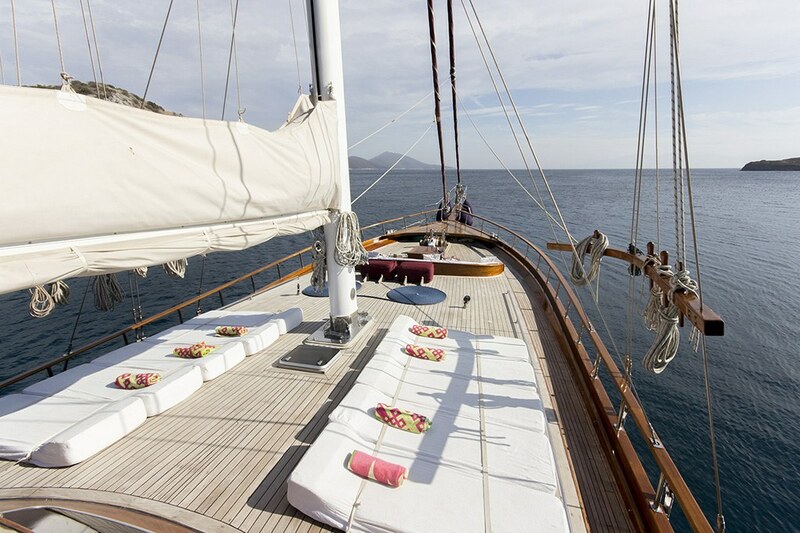 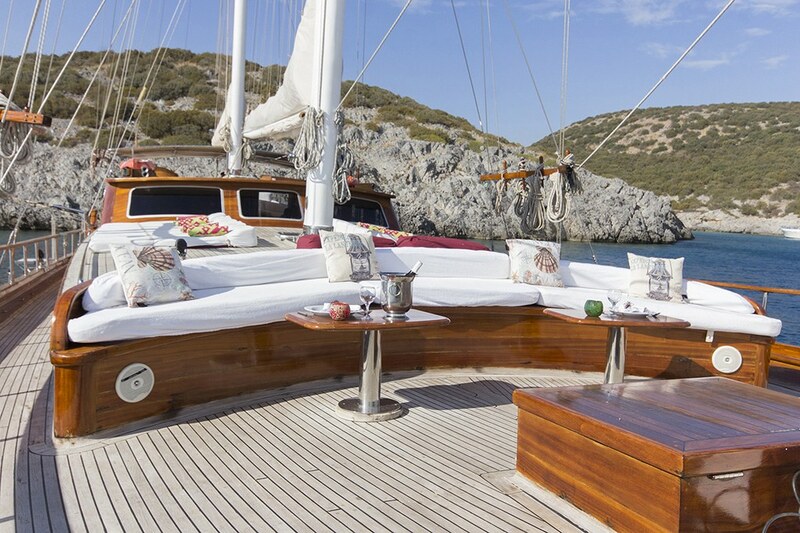 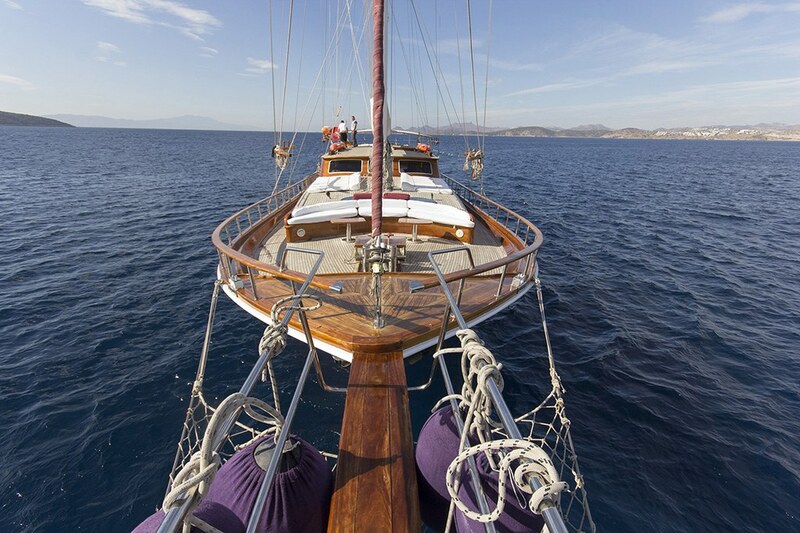 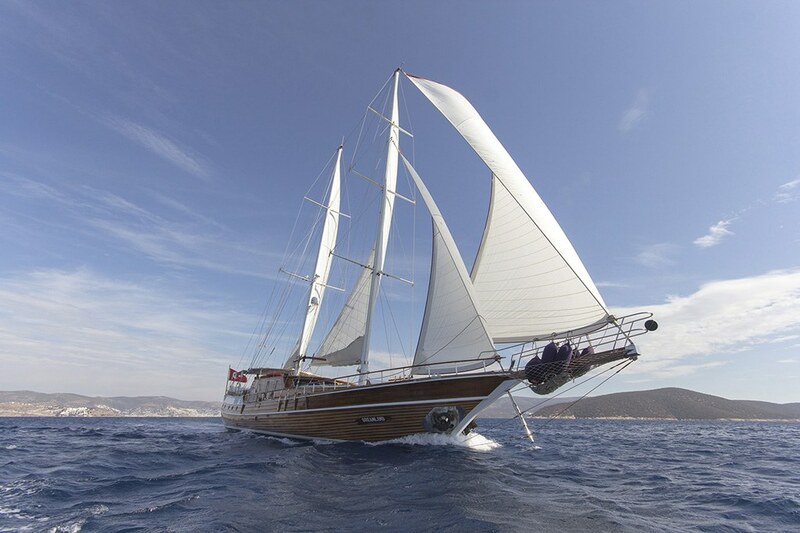 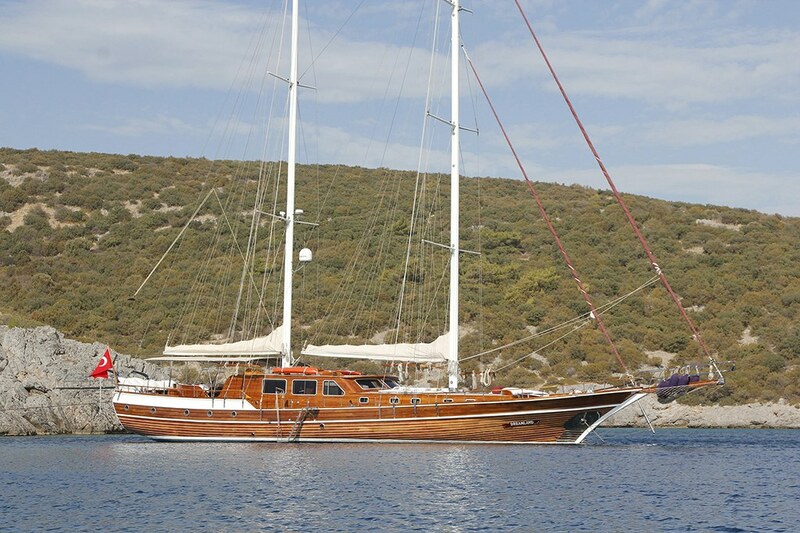 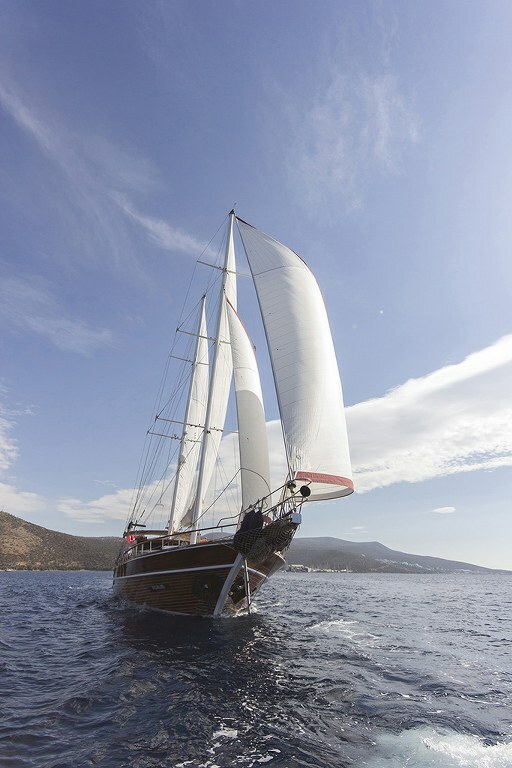 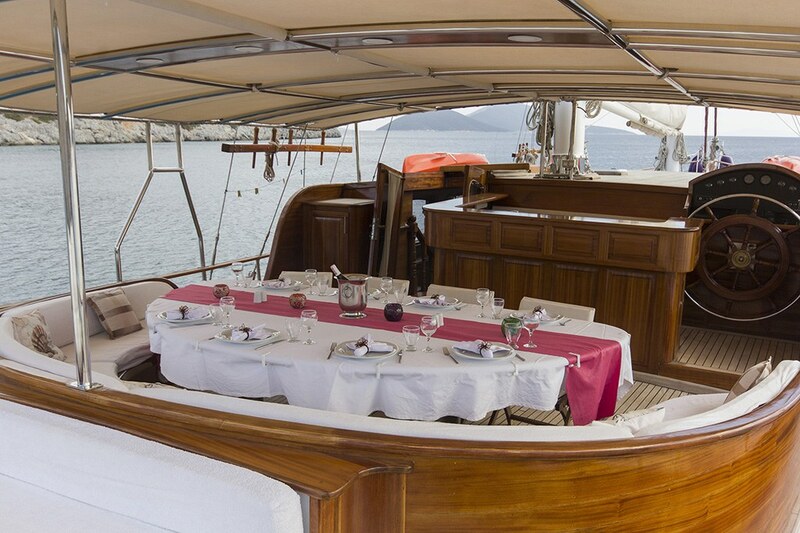 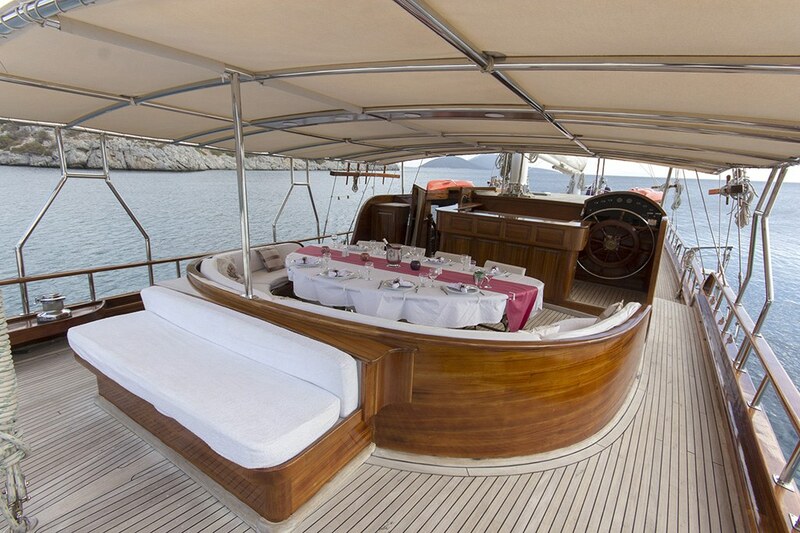 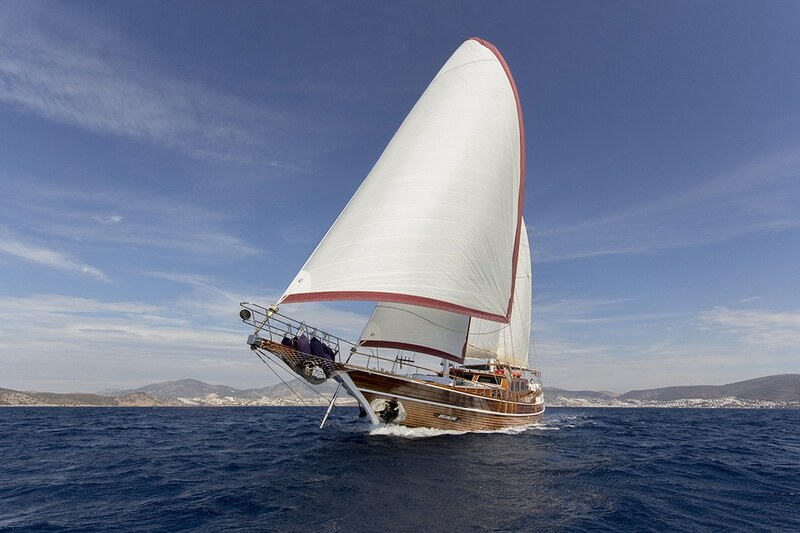 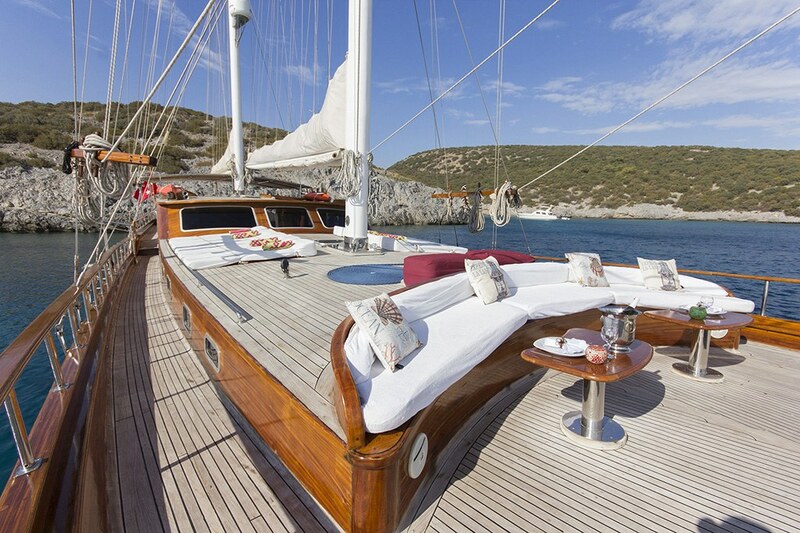 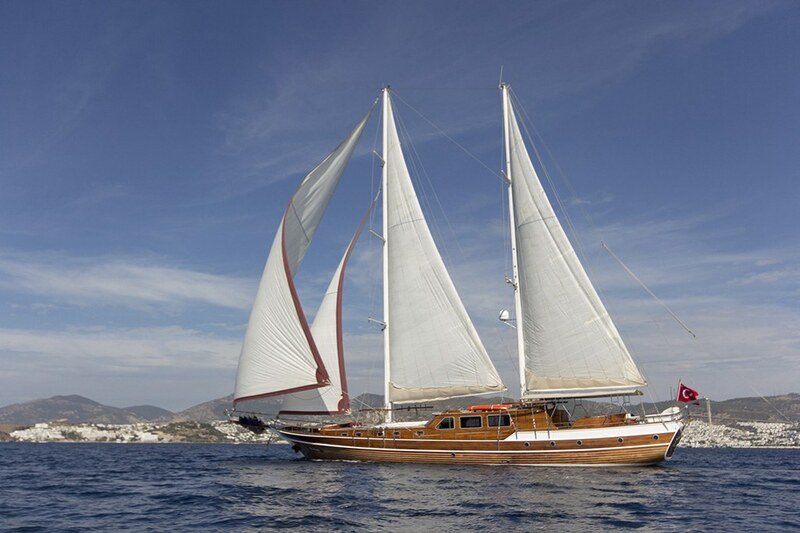 Enjoy the care and attention of a Bodrum owned, built and captained deluxe gulet on your cruise.